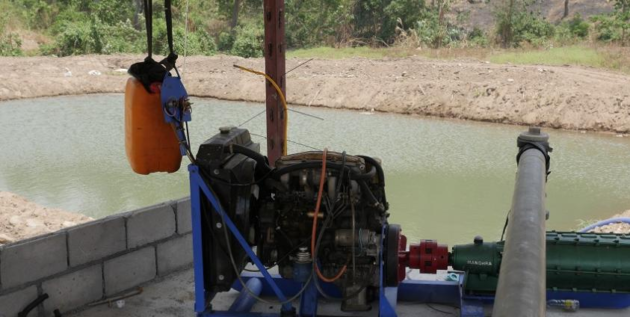 A new town established by the Karen National Union (KNU) and the Karen State government for displaced residents in Myawaddy District, Karen State is currently suffering from water shortage. Water is distributed to Lay Kay Kaw New Town (Myothit) through the pipelines from Taung Kone (locally known as Kyauk Gu), which is around three miles from the new town. The residents have been suffering from water shortage and they have to buy water after the water started running low since early summer, according to the town’s resident Saw Mu Kho Baw. “The ward administrator said water will be distributed every three days, but it didn’t come even after five days. It only comes once a week. If it didn’t come after a week, we have to order and buy water from the water truck or seek assistance from those who have built water tanks to share their water. This [water shortage] started since last year, but it got worse this year,” he told Karen News. He continued that it will be better if the authorities regularly distribute the water once a day or every two days in each ward to solve the water shortage issue. The authorities of the Lay Kay Kaw New Town explained that water shortage is caused by an increase in the settlement of returning refugees and deforestation and extreme heat. “Only a little amount of water comes out from the water source since last year. Since the water is limestone water, the limestone became blocked in the pipeline so water started running low. Now, it’s very hot and many trees and bamboo trees have been cut down so the water source became depleted,” said Saw Ta Ant Law Thaw, in-charge of Lay Kay Kaw New Town Administration office. The local authorities are trying to solve the water shortage issue by building a water pond near Htee Nu Stream, which is three miles away from Lay Kay Kaw New Town. Water from this pond will be pumped to a water pond on the top of the hill, which will then distribute the water to the new town, he added. Thoo Lei Company implemented Lay Kay Kaw New Town project in 2014 after negotiations between the KNU and the government to accommodate conflicted-affected communities including displaced residents, refugees and family members of the KNU. Under the assistance from Nippon Foundation, 680 low-cost houses have been currently built in Lay Kay Kaw New Town and over 2,000 people are living in these houses. Over 100 new houses are also being built in the new town, according to the town officials.